The symbol of the cross is a powerful reminder of the single event that altered all of history. It brings to mind the ultimate demonstration of love: Christ giving his own life so that we could know what it means to truly live. 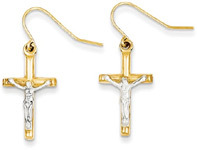 Why not remind yourself and those around you of this ultimate sacrifice with a pair of cross earring from Applesofgold.com? Read more. The symbol of the cross has been interpreted in numerous ways throughout the centuries, and each version gives a unique look to the shape that will forever represent the supreme act of love that altered all history. From simple designs to gothic looks to crosses formed from the fleur-de-lis, every interpretation of the cross in Apples of Gold�s selection of cross earrings still boils down to a simple yet life-changing message, presented in a beautiful, meaningful form. Cross earrings come in a wide range of styles, making it possible for nearly anyone to make a statement about their faith that coordinates with their personal taste. Whether you gravitate toward subtle statements or bold declarations, Apples of Gold�s collection of cross earrings has a pair that�s perfect for you. Cross stud earrings are subtle but unmistakable symbols of faith, quietly making a statement without screaming. Simple 14K gold cross studs are classic pieces that you�ll be able to wear no matter what trends are taking over the fashion scene. Choose a diamond-accented style for a look that�s still timeless, but with a little extra sparkle. Dangling crosses grab more attention than studs, but when you�re drawing attention to a reminder of what Christ did for all mankind, that can only be a good thing. Like simple studs, dangling cross earrings have a measure of timelessness, but they have a bolder look than styles that prefer to cling to your ears. If designs that are more one-of-a-kind are more up your alley, consider one of Apples of Gold�s unique pairs of sterling silver cross earrings. From hammered crosses to engraved, antiqued studs, these artistic looks allow you to express your fashion sense as well as your faith. While pendants may be the first type of jewelry that comes to mind when you think of pieces that feature the cross, don�t overlook cross earrings! These pieces keep your faith close to mind and declare to the word that your life has been changed by what Christ did for all mankind over 2,000 years ago.